1 Single bedroom. 2 Double bedrooms. 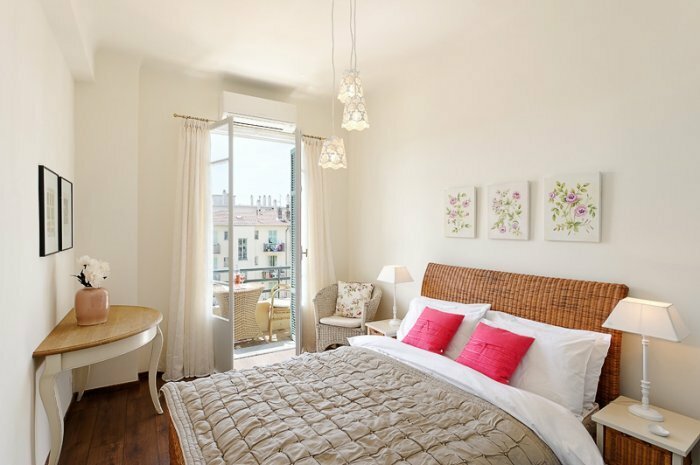 Like the rest of this apartment, the rooms are tall and elegant but its the small details that brings the apartment to life. The furniture is both intricate and bold. The enormous white leather corner sofa and large walnut coffee table are softened by a colour palette of blues and taupes and more graceful pieces like the overhead chandlier, table lamps, mirrors and framed artwork keeps the space inviting and interesting. Because of the doors at both ends of this apartment it's possible for the summer breeze to waft through. Evenings may well be spent on the balcony enjoying the sparkly view of the Collines but if you prefer to curl up in-front of the box there is a large LCD TV. The large wooden dining table takes centre stage. There are four high backed black wooden chairs seated around it, along with a fifth by the window if needed. The wooden units hold a built in fridge and freezer and dishwasher and there is also a microwave, four ring hob and extractor fan. When dinner is simmering you can step onto the balcony and listen to the laughter of children at play in the park opposite or take in the mountain views. The spacious master bedroom with ensuite shower room has a king sized bed, bedside tables and lamps, and a fitted wardrobe. 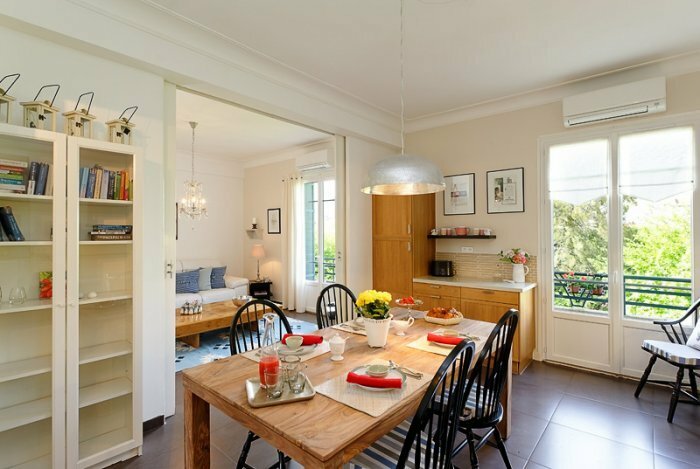 Double glazed French doors open onto a balcony which gets the sun in the morning, with views of the park and collines of Nice. 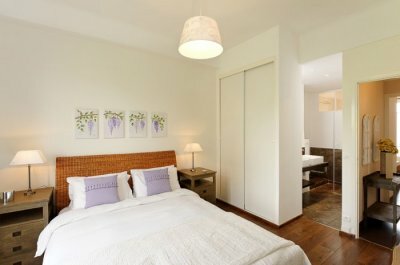 The second bedroom has a double bed, bedside tables and lamps, and a large wardrobe. There are French windows that open onto a rear balcony overlooking a large courtyard, which enjoys the sun from lunchtime onwards. The third bedroom contains a full size single bed, drawers and reading lamp. Both of the bigger bedrooms will fit a baby cot. Cots can be ordered at checkout on our website. Please see our packages for more details. Take a book and a towel from the shelving unit and soak in the big-enough-for two Philippe Starck bath. 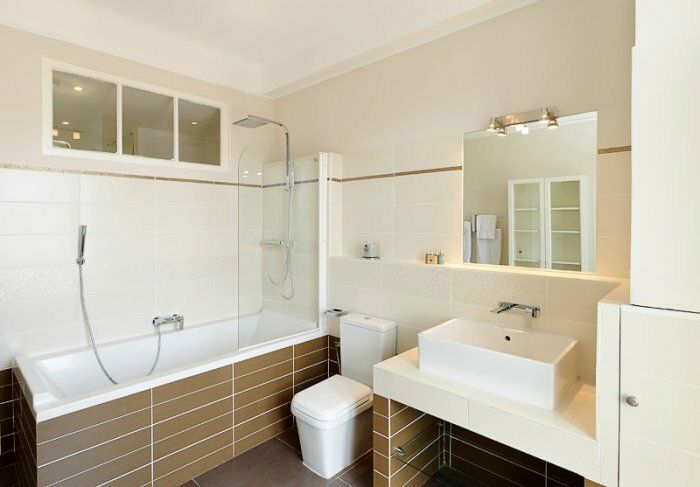 If showers are more your thing, there's a choice of no less than three different shower options over the bath with glass shower screen. Other amenities are the large wash hand basin and toilet as well as towel radiator. The washing machine is discretely situated inside a cupboard. French doors lead out onto the rear balcony. The ensuite shower room has two washbasins with large mirrors and a toilet and walk in powerful shower. Outside Amenities: There is a small balcony area lining both sides of the building. The apartment is situated opposite a pleasant communal park. 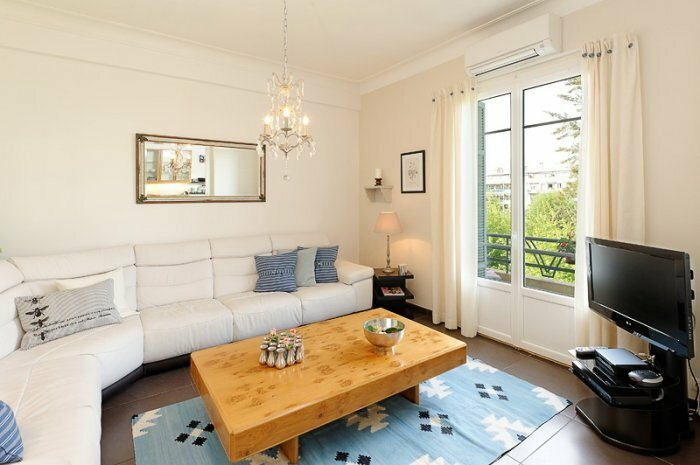 There are plenty of shops and cafes in the local area and a large Carrefour supermarket is only a few minutes walk away, whilst a bio-supermarket is two minutes walk way. 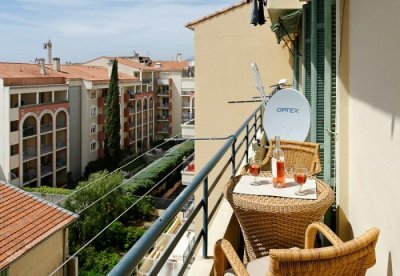 Another bonus is that it's only a 5 minute walk to the local train station, Riquier for trips to Cannes, Menton and Ventimiglia. There is a regular tram service about a five minute walk away which links you directly with the Old Town and the shopping districts of Place Massena and the Carre d'Or. The Port and Old Town are about a 10-15 minutes walk away. Hob. Microwave. Fridge. Freezer. Dishwasher. Washing Machine. Children welcome. No smokers. Pets may be allowed by prior agreement. Small dogs are accepted but an additional fee is required. Pricing Info: Available for longer lets between October and April inclusive for 1400 GBP per month. Price includes all utilities, linen and towels.